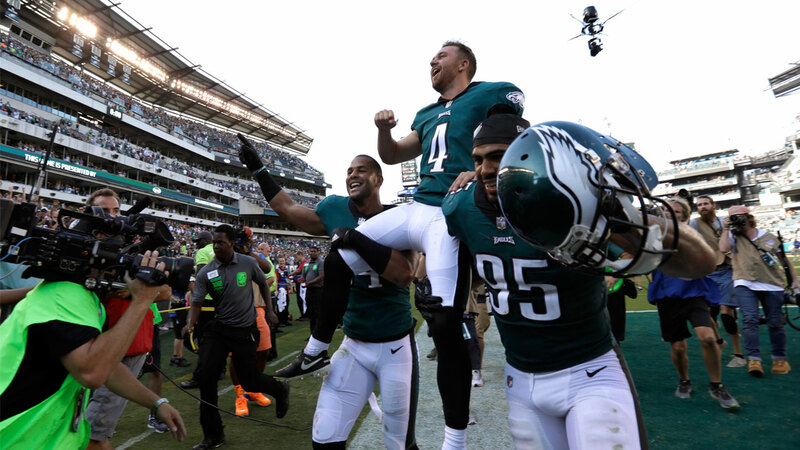 PHILADELPHIA -- Jake Elliott kicked a 61-yard field goal as the clock expired to lift the Philadelphia Eagles to a 27-24 victory over the New York Giants on Sunday. Carson Wentz tossed a 19-yard pass to Alshon Jeffery to set up Elliott's kick. The rookie was a fifth-round pick by the Bengals and joined the Eagles after Caleb Sturgis was injured in Week 1. He was carried off the field by two teammates. The Giants (0-3) hadn't scored 20 points in eight straight games before Manning led them to 21 in a span of 5:21. He tossed TD passes of 10 yards and 4 yards to Odell Beckham Jr. to tie it at 14. Manning then connected over the middle to Shepard, who broke a couple tackles and sprinted all the way for a 21-14 lead. But the penalty wasn't costly. New York quickly got the ball back at Philadelphia's 33 when Landon Collins forced Zach Ertz to fumble and Apple recovered at the Eagles 33. The Eagles went up 7-0 on LeGarrette Blount's 1-yard TD run that capped an 18-play, 90-yard drive. Blount had a rumbling 17-yard run early in the drive and Wentz later kept it going with a nifty, 11-yard scramble on third-and-8. Manning's second pick came on a tipped ball that came down into Patrick Robinson's hands in the third quarter. Wentz threw a 2-yard TD pass to Ertz on the ensuing possession to give Philadelphia a 14-0 lead. Giants: at Tampa Bay Buccaneers.